You need to apply for an Energy Performance Certificate (EPC) before you put your home on the market and you can be fined if you don't get an EPC when you need one. When do I need an energy performance certificate? It's a standardised document which ranks properties in terms of energy efficiency, and which home sellers have to provide to potential buyers. EPC's include information about the property's energy use and costs as well as recommendations about how to make it more efficient and cheaper to heat. Properties are ranked from A to G.
The most efficient homes - which should have the lowest fuel bills - are in band A. Home sellers in Scotland have to provide a more extensive "home report", which includes an EPC, as well as a survey and a property questionnaire. When Do I Need An Energy Performance Certificate (EPC)? Information about a property's energy use and typical energy costs. In England and Wales, the price of an EPC can be as low as £24 for a studio in a city centre, stretching to around £120 for a larger property in a remote area. In Scotland the cost of a home report starts at around £600. Your estate agent will be able to give you a quote for a survey and energy report, as will the Royal Institution of Chartered Surveyors (RICS). 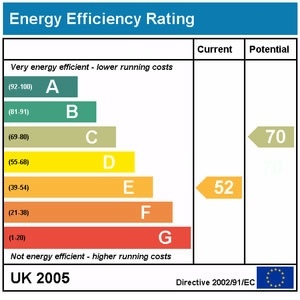 If you leave it to your estate agent to arrange an EPC, keep in mind that they will probably charge commission. Prices may be negotiable, so don't be afraid to haggle. You'll need to find an accredited assessor if you're selling or renting out your home. They'll assess your property and produce the certificate. In England, Wales and Northern Island you can use epcregister.com to find an energy assessor. In Scotland you can use the scottishepcregister.org.uk EPC Assessor search or this list provided by the Scottish Government. The person selling the house, the landlord or the letting agent must show you the EPC if you're buying or renting. Industrial sites, workshops and non-residential agricultural buildings that don't use a lot of energy. Holiday accommodation that's rented out for less than 4 months a year or is let under a licence to occupy. Listed buildings - you should get advice from your local authority conservation officer if the work would alter the building's character. The Green Deal was launched by the government in October 2011 to help people make their homes warmer, more energy efficient and cheaper to heat. Under the scheme you choose which eligible energy saving improvements you want to make and pay for the improvements over time through your electricity bill, at a level no greater than the estimated savings to energy bills. If you move home, the Green Deal charge stays with the property and the repayments pass to the new bill payer. You can apply whether you're a tenant or an owner and you might be eligible for extra help if your household gets income-related benefits. Find out how you could make your home more energy efficient using the EPC adviser. Last updated on 23/03/2015 by Jonathan Rolande.